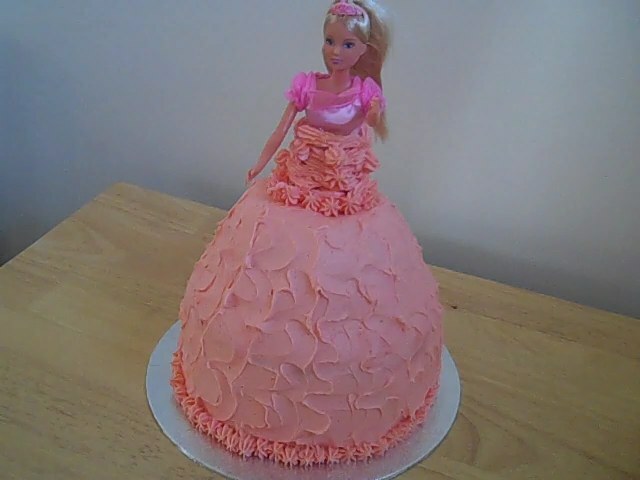 This is one of the easier birthday cakes I’ve made. This one was for Elsie’s birthday last weekend. Sandwich the cake together with some of the buttercream then spread the rest over the top and around the sides of the cake. 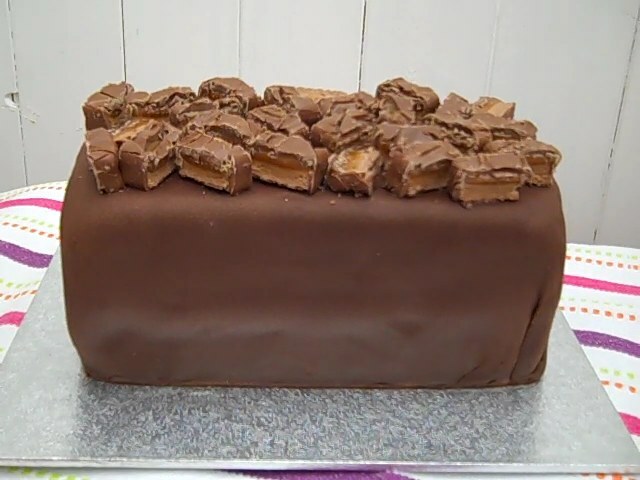 Press the KitKat’s gently into the buttercream all around the sides, I used about 20, 2 finger KitKat’s. 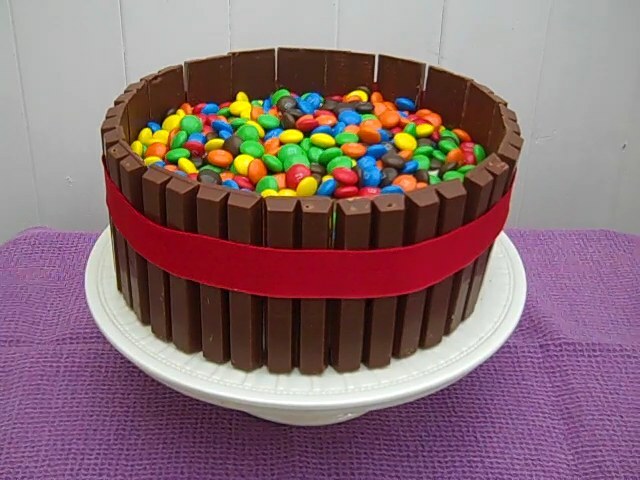 Then fill the top with M&M’s. Must admit when I started this one I did get a bit stressed, but once I’d got going it was easier than I thought it was going to be. To start you’ll need 2, 21cm/8” square madeira cakes. Line a 21cm/8” deep square tin with baking parchment. Preheat oven to 180C/gas 4. Start by blending the butter and sugars together until the mixture is light and fluffy. Add the eggs one at a time. To stop the mixture from curdling add a spoon of the flour as you add each egg. Once all the eggs have been combined, add the rest of the flour with the baking powder and continue to mix.Ensure all the ingredients have been mixed to a smooth consistency then add the hot water, slowly, until it is completely blended. Pour the cake mix to the tin and bake for 1hr 15mins. Check it after an hour as you might need to cover the top with foil to stop it burning during the last 15mins. Once you have removed the cake from the oven leave it to cool for 10-20 minutes then turn it out onto a cooling rack. Don’t leave the cake in the tin to cool completely as it will ‘sweat’ and go soggy rather than stay moist. I read about this technique on a blog and was a bit dubious about it working, but it does work! Ensure that the oven is at the right temperature before you start. Line the baking tin as usual and pour the Madeira mixture into the tin. Scoop the centre of the cake mix up to the sides so that you can see the bottom of the tin and then pop it in the oven. Avoid opening the door to peek. Don’t worry the cake will fill the hole, bake perfectly and be nice and flat. Cream the butter until it turns pale. Add a little milk if necessary to make a smooth consistency. Add the food colouring, a little at a time until you have your desired colour. Cut your first cake in half, spread the one half with jam, the other half with some of the buttercream and sandwich together. Using the second cake, cut in half again, as with the first cake and put the one half to one side. Now cut the half you have into quarters. Using two of those quarters, sandwich them together with jam and buttercream and place in the centre of the larger one you have already sandwiched together. Crumbcoat the whole cake and leave in the fridge for an hour. Once out of the fridge, buttercream the whole cake. Put the glimmer sugar onto a plate. Cover the ice cream cones, one at a time, with buttercream then roll in the glimmer sugar. Place one at each corner of the base cake and one in the centre of the top cake, pressing down gently into the buttercream. Add a sugar ball to the top of each cone. Use two wafer biscuits for the doors and cut some in half for the windows, use a little royal icing to outline them. 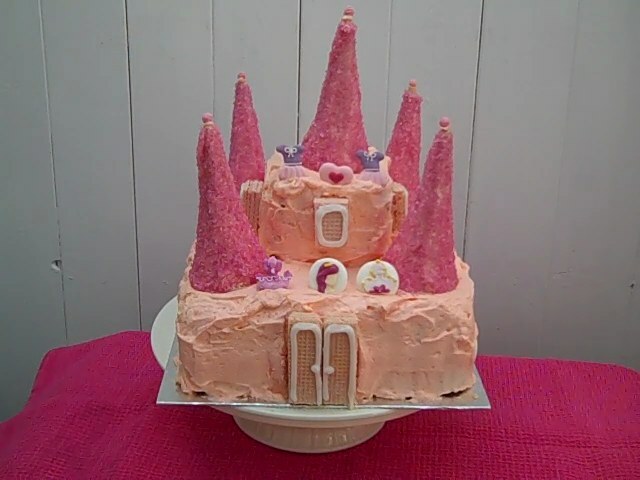 Add the princess sugar shapes around the castle walls. I wanted a slightly taller cake to give the candles some length so made two of the below recipe then put them together with buttercream. Line a square 8″, deep, cake tin. Pre heat the oven to 180c/gas 4. Cream the butter and sugar together until it’s pale, light and fluffy. Sift the flour and salt into the mixture and beat again. Pour the mixture into the ready lined tin, level off with a spatula and bake for 50 – 55 minutes until well risen, golden brown and begining to shrink from the sides. Remove from the oven and leave in the tin for 5 minutes before turning out onto a wire rack to cool completely. Beat the butter, milk, vanilla extract and half the icing sugar until smooth. Gradually add the rest of the icing sugar and beat well until the buttercream is smooth and creamy. Place the buttercream filled cake onto a 9″ square cake board. Use the white fondant to cover the cake completely, trim the edges neatly. Roll out the green fondant and cut into 5 1/2″ strips of unequal lengths, but each long enough to go up the side and on to the top of the cake. Make a diagonal cut at one end of each. With a little water, attach these to the cake. Roll out the yellow fondant and stamp out the flames using a leaf-shaped cutter. Attach in place with a little water. With a red edible-ink pen draw a wavy line in the centre of each flame then attach an edible sugar ball in the base of each flame. 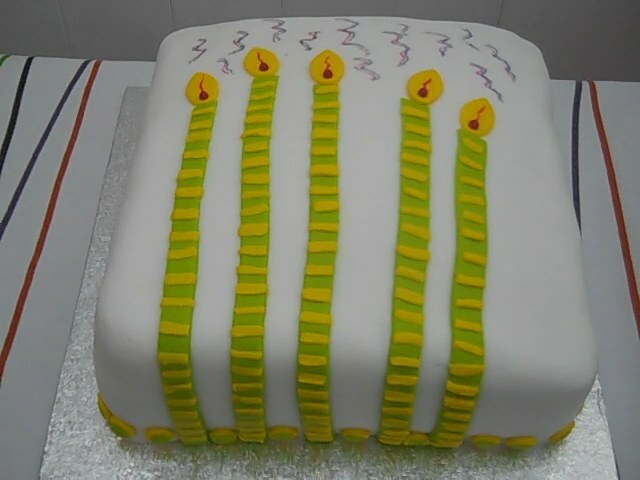 Cut small strips of the yellow fondant and attach to the candles. Roll out the remaining yellow fondant and stamp out small circles using the end of a piping nozzle. Repeat with the green fondant, using a smaller nozzle. Attach the green circles to the yellow circles with a little water, Attach these all around the base of the cake. Draw wavy lines above the candles with the edible-ink pens. I used red and blue. 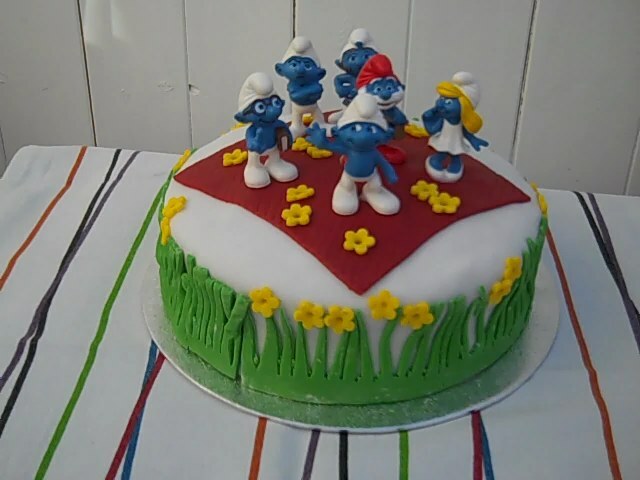 Made this for my Smurf loving Granddaughter who recently had a 2nd birthday party. No recipe for this as I’m just putting it here to keep it. Also you can find the recipe for a Victoria Sponge cake on here from the search bar. 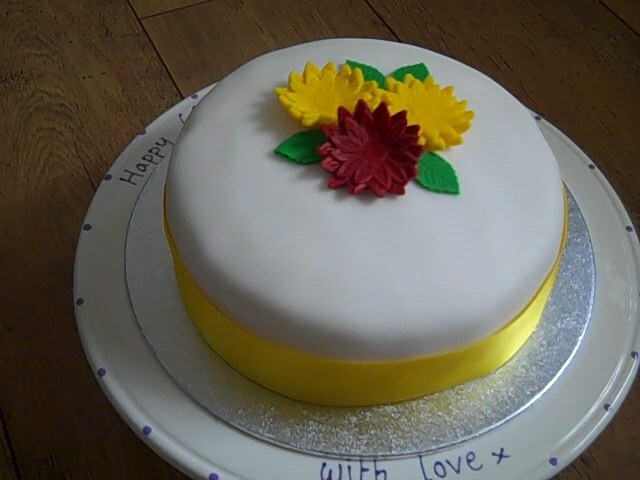 A Gerbera flowering birthday cake for my daughter in law. Happy birthday Beth! Grease and line with baking parchment paper, two sponge tins. Cream the butter and sugar together until pale, light and fluffy. Add the egg, one at a time, beating after each addition. Sift in the flour and salt, and beat again. Add the lemon zest and fold in. Bake for 25 – 30 minutes until well risen, golden brown and begining to shrink from the sides of the tin. Allow to stand for 5 minutes then place on a wire rack to cool completely. Once cold, spread one cake with lemon curd, the other with half of the lemon buttercream and sandwich together. Crumbcoat the whole cake with the rest of the lemon buttercream and place in the fridge for an hour. Roll out the white fondant and cover the cake, smoothing over as you go. Using flower cutters, cut out flowers from the red and yellow fondant, leaves from the green fondant, attach these to the cake with a tiny dab of water. Prefferably keep the cake under a food net or cardboard cake box rather than a plastic container. Beat the butter, lemon juice, lemon zest and half the icing sugar until smooth. Gradually add the remainder of the icing sugar and beat until smooth and creamy. Pre heat the oven to 180C/gas mark 4. Line three 8ins sponge tins and grease one 1lb pudding bowl. Cream the butter and sugar together until it’s light and fluffy. Add the egg’s one at a time beating a little after each addition. Sift the flour into the mixture and beat well. Divide the mixture between the three tins and the bowl. Bake what you have in the tins for 25 – 30 minutes until risen and golden brown, then put the pudding bowl of mixture in and bake on a lower shelf for approximately 55 minutes. Check with a skewer to make sure it’s cooked through, if longer time is needed you can cover it with foil to prevent any burning of the top. Leave all to cool completely. Once cooled, using a 2ins plain biscuit cutter, cut a hole through the middle of all four cakes. In a large mixing bowl beat the butter, milk, vanilla extract and half of the icing sugar until smooth. Gradually add the remainder of the icing sugar and continue beating until the buttercream is smooth and creamy. Add food colouring a drop at a time, beating well after each addition until you have the required colour. Spread jam on one sponge, buttercream on the second sponge and sandwich them together, then repeat using the third sponge. Repeat again, ending up with the pudding basin shaped sponge turned upside down as the top of the cake. Cover the whole thing with a light covering of buttercream and leave in the Fridge for an hour. Wrap the doll in cling film, this saves her getting covered in cake crumbs and buttercream. Then place her in the middle of the cake. Spread more buttercream all over the cake. Using a small round ended/butter knife make swirls all over the dress to give it a pattern. Using a star nozzle, pipe star’s around the base and top of the dress.